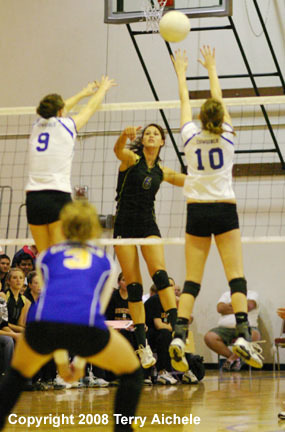 Kayleigh Barnitz, number 11 in the far court, blocks a shot by Katie Leavitt of Crook County. 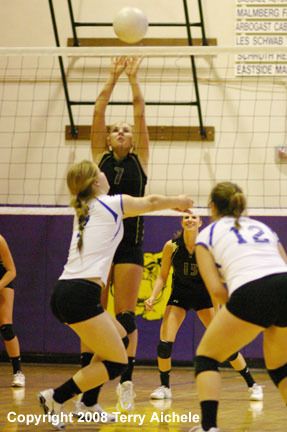 HERMISTON - The Hermiston Bulldogs hosted the Crook County Cowgirls on Saturday. Hermiston won the first set 25-19 then lost the next three, 23-25, 13-25 and 9-25. 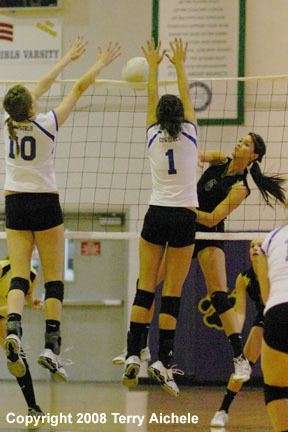 Hermiston showed real strength in the first game. While it was a close set with the score tied eight times Hermiston was able to control the net and shut the Cowgirls down at 19 and run out the rest of the set. The second set had Hermiston take a 3-0 lead early on. Crook County closed in to tie it 3-3 then Hermsiton pulled away to an 8-4 lead. Hermiston then pushed their lead out to 13-7. 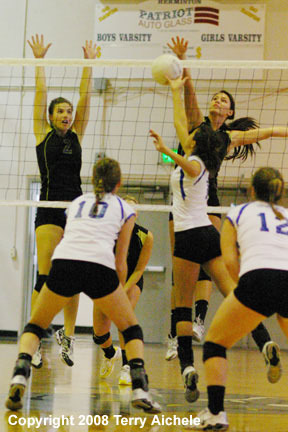 Mary Shae Hays, Jade Crossley, Marie Pedro, and Amanda Bevington where having a nice set up to a 20-20 score. Bevington for example kept the volley going with three saves to get the side out for the Dawgs at 19-18. Then Cassie Law went a long run of serve for the Cowgirls including an ace to give Crook County the 22-20 lead. Even with Hays hitting a kill late in the set, it was too little as Crook County nailed their shots to squeek out a 25-23 win. Crook County took command in the third set especially at the midway point when the Cowgirls nailed a series of kills by Casey Loper and Krissi Kemper to take the lead to 17-7. Hermiston was able to start scoring again but it was too little too late and the score ended up being a win for Crook County 25-13. 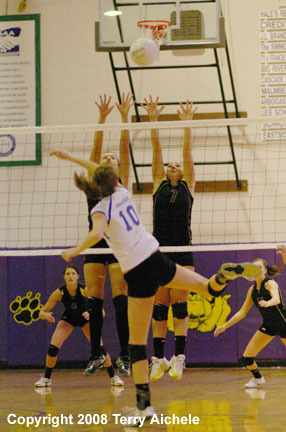 The fourth set saw Hermiston come out completely flat. 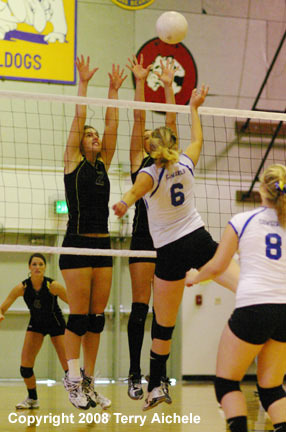 The Cowgirls scored eight straight point before the Dawgs where able to get a side out. Kari Barton hit a kill to get a sideout for Hermiston at 2-11. Crook County went on a scoring run from leading 12-4 to leading 17-4. Crook County basically shut down the Dawgs in the final minutes of the set for a 25-9 win. LEFT - Hermiston's Andrea Waters, left, and Mary Shae Hays, right, get into position to block a shot by a Crook County player. 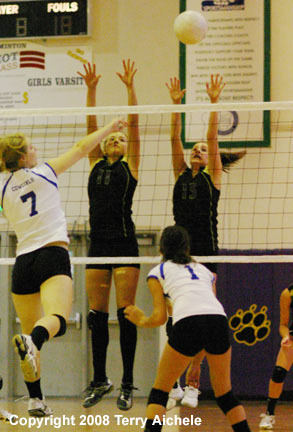 RIGHT - Maloree Moss, left, backs up Jade Crossley of Hermiston while Crossley bumps a serve from Crook County. LEFT - Mary Shae Hays in the far court blasts a shot towards Krissi Kemper, left, and Emily Gannon, right, of Crook County. RIGHT - Mary Shae Hays in the far court hits a shot over the outstretched fingers of Krissi Kemper of Crook County. To Kemper's left is Katie Leavitt. LEFT - Krissi Kemper of Crook County in the near court hits a shot over the leaping Marie Pedro of Hermiston. RIGHT - Kayleigh Barnitz and Hannah Whitsett of Hermiston in the far court react to a shot by Courtney Michel of Crook County. LEFT - Mary Shae Hays and Hannah Whitsett in the far court leap in reaction to the shot by Krissi Kemper of Crook County. RIGHT - Krissi Kemper blasts a shot at Hermiston defenders during the match on Saturday. LEFT - Mary Shae Hays of Hermiston hits a spike into a group of Crook County defenders including Krissi Kemper, Jazmin Orozco, Katie Leavitt, and Casey Loper. 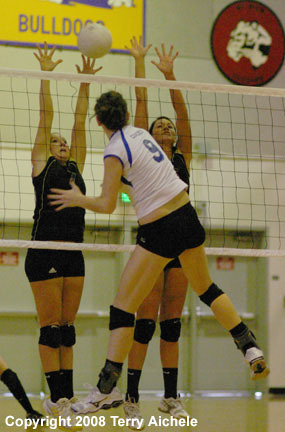 RIGHT - Marie Pedro and Mary Shae Hays attempt to block a shot by Katie Leavitt of Crook County. 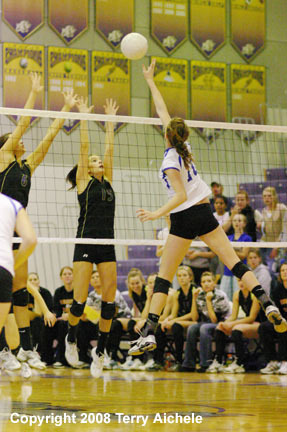 LEFT - Marie Pedro of Hermiston in the far court leaps to attempt to block a shot by a Crook County player. 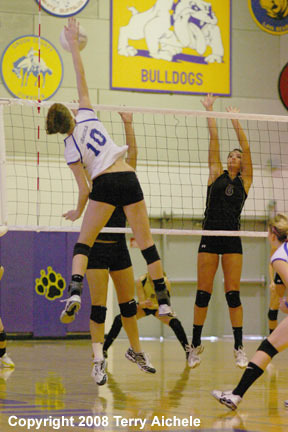 RIGHT - Andrea Waters on the left jumps to block a shot by Casey Loper of Crook County. The Hermiston Bulldog volleyball team lines up during introductions at the match on Saturday. Andrea Waters blasts a shot between Crook County defenders Katie Leavitt and Krissi Kemper.